Now available in a sprayable form. Covers up to 300 sq ft of rusted surface. Labor saving process converts rust into a protective layer that can then be painted over. New Sprayable formula is great for covering large areas quickly. Sprayable Rust Converter can be applied to just about any rusted iron or steel surface, the sprayable version is thinner so it is easier to spray with conventional sprayers. It converts rust into a protective black layer that seals out moisture and protects against future corrosion. Sprayable Rust converter is sprayed like a primer to rusted surfaces. 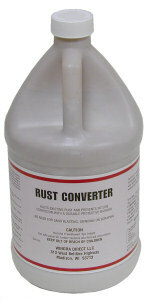 Instead of the longer process of removing the rust on larger surfaces, rust converter is applied over existing rust after simply removing the loose rust. This labor-saving process greatly reduces the time involved on many projects. A second coat of Sprayable Rust Converter will provide a greater level of protection. An optional top coat of oil-based paint is all that is needed to provide outdoor protection to your new surface. Sprayable Rust Converter, a water-based primer, contains two active ingredients: Tannic acid and an organic polymer. The first ingredient, tannic acid, reacts with iron oxide (rust) and chemically converts it to iron tannate, a dark-colored stable material. Tannins are a group of water- and alcohol-soluble natural products extracted from fruits, trees and grasses. The second active ingredient, 2-Butoxyethanol, is an organic polymer that provides a protective primer layer. The overall chemical reaction converts rust into a stable, black protective polymeric coating. Because it’s water-based, Rust Converter is environmentally safe, non-flammable, and safe to use. One gallon covers up to 300 square feet of rusted metal. Porous and irregular surfaces will require a second coat. Sprayable Rust Converter has a nine month shelf life. Detailed instructions are provided on the bottle. Made in the USA.